Quidditch pong – that’s butterbeer pong, Harry Potter style – was going strong Friday night at downtown’s Arizona Science Center. But a little owl told the spirited muggles gathered for “The Science of Harry Potter” – part of the after-hours Science With a Twist series for adults who are sweet on science – that something magical was about to materialize in the science center’s auditorium. 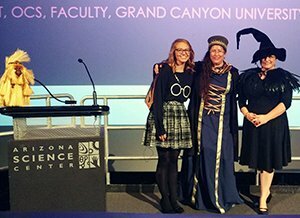 GCU faculty members Lindsey Kojich, Deborah Haralson and Darien Hall (from left) explored how close to reality the fantastic creatures in the Harry Potter world might be during Science With a Twist at the Arizona Science Center on Friday night. It’s where GCU faculty members Deborah Haralson, Lindsey Kojich and Darien Hall double, double, toil and troubled themselves over “Zoology in the Harry Potter Universe,” a one-hour, science-based, Potter world-themed talk designed to analyze the various creatures in the Potter universe, compare those creatures to similar ones in mythology and the muggle world, and even do a little debunking of these creatures, pondering whether they could operate in the real world or could exist solely via magic. Haralson said she was at the Arizona Science Center with her father two months ago for the Doctor Who-themed Science With a Twist when she heard about a Potter-themed adults night out and started a conversation with the center about helming a science-based talk. “I had given a talk at last year’s Phoenix Comicon that was similar,” said Haralson, who teaches computer science and information technology in GCU’s College of Science, Engineering and Technology. It was at Phoenix Comicon that she addressed “Cybersecurity in Star Wars: It’s an Older Code, but it Checks Out,” in which a panel of cybersecurity experts discussed how poor password security led to the annihilation of two Empire Death Stars, among other ways the Empire went wrong. Like with “Cybersecurity in Star Wars,” “Zoology in the Harry Potter Universe” took a beloved fantasy franchise and brought real-world science into the picture, looking at the feasibility of the Potter world’s magical menagerie. The trio of professors, dressed in robes and witch’s hats, tackled more than a dozen creatures during the first of two sessions, from erumpent to hippogriff, giants and trolls, bowtruckle, billywig, selkie, mooncalf and pukwudgie, to name a few. Hall, who teaches biology, genetics and human anatomy and physiology, had a bit of fun with her research into the Potter universe’s giants and trolls. 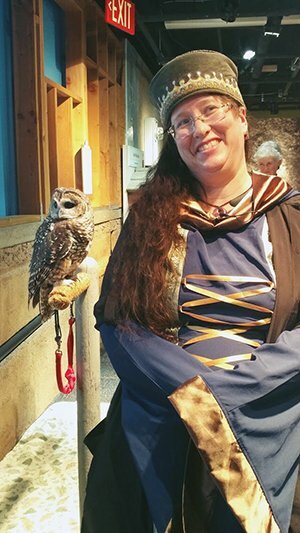 Haralson spoke about the cybersecurity issues in the “Star Wars” universe at Phoenix Comicon last year and decided to bring the same scientific pondering to the Arizona Science Center on Friday night for a Harry Potter-themed Science With a Twist. Then Hall went into science mode. Humans can reach some unusual heights, she said, but it’s mainly because of a pituitary gland issue. “Robert Wadlow reached 8 feet, 11 inches. … He only lived, unfortunately to 22 or 23 because he suffered from cardiovascular difficulties. … He couldn’t feel his feet,” she said, and ended up dying of sepsis that started with a blister on his ankle. Trolls might be gray in color, she surmised, because of a genetic condition. In humans, there is a rare condition called methemoglobinemia. In her research, she came upon the Fugate family, from the hills of Kentucky, who have this ailment, a symptom of which is blue skin. “The last known blue person (in the family) actually was born in 1975,” she said, adding that he was born blue but later in life turned a “healthy pink” and might only have been a carrier of the condition. Kojich, who teaches anatomy, physiology and exercise science, and her fellow GCU presenters took direction from the audience, who wanted to know more about hippogriff, a Potter creature that’s a cross between an eagle and a horse. She told the audience about some important bird features. They’re pneumatic, meaning their bones have holes in them to help make them light enough for flight. And she also gave this little detail: They have no bladder. “So gravity makes them poop?” Haralson asked, fascinated. She also spoke about the Potter universe’s thunderbird. “Arizona!” answered the audience, which also asked for the presenters to talk about billywig, a fantastical creature with wings emerging from the top of its head. Or, of course, he might just require a little magic. 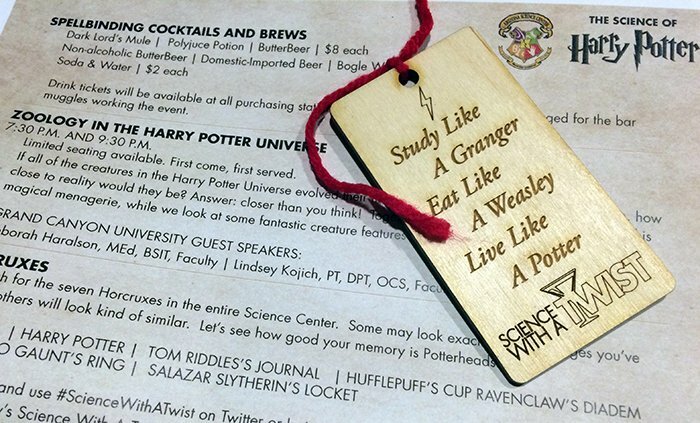 In addition to the GCU faculty-led “Zoology in the Harry Potter Universe” talk, the Science With a Twist evening also featured live owls, butterbeer, the search for seven Horcruxes hidden in the center, laser shows, an activity kit area, and even dissected snakes and toads. 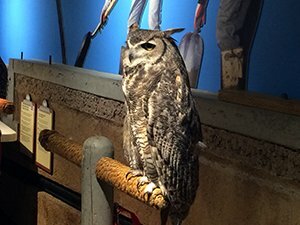 Live owls, dissected toads, Quidditch butterbeer pong and a GCU faculty-led talk about the “Zoology of the Harry Potter Universe” were part of the Arizona Science Center’s Potter-themed Science With a Twist on Friday. The series is for adults who love science. The event drew hundreds who stood in line outside the science center waiting to get inside to the sold-out event. Haralson, Kojich and Hall haven’t been the only GCU faculty to lead a Science With a Twist talk. In September, Melissa Beddow, Director of the University’s Bachelor of Science in Forensic Science program, dissected forensics-focused television shows, comparing them to what happens in an actual crime lab. The talks highlight GCU as a leader in STEM (science, engineering and technology), while building bridges in the community and establishing relationships with organizations such as the Arizona Science Center.